For the modern New Zealand aircraft company, see Vickers Aircraft Company. For other uses, see Vickers (disambiguation). Vickers was formed in Sheffield as a steel foundry by the miller Edward Vickers and his father-in-law George Naylor in 1828. Naylor was a partner in the foundry Naylor & Sanderson and Vickers' brother William owned a steel rolling operation. Edward's investments in the railway industry allowed him to gain control of the company, based at Millsands and known as Naylor Vickers and Company. It began life making steel castings and quickly became famous for casting church bells. In 1854 Vickers' sons Thomas (a militia officer known familiarly as 'Colonel Tom') and Albert [la] joined the business and their considerable talents – Tom Vickers as a metallurgist and Albert as a team-builder and salesman – were key to its subsequent rapid development. "Its great architects," the historian Clive Trebilcock writes, "Colonel T.E. (1833–1915) and Albert (1838–1919) Vickers... provided both inspired technical leadership... and equally astute commercial direction. Both men were autocrats by temperament, but neither shunned advice or avoided delegation; each, but particularly Albert, had a marked gift for the selection of talented subordinates." In 1863 the company moved to a new site in Sheffield on the River Don in Brightside. The company went public in 1867 as Vickers, Sons & Company and gradually acquired more businesses, branching out into various sectors. In 1868 Vickers began to manufacture marine shafts, in 1872 they began casting marine propellers and in 1882 they set up a forging press. Vickers produced their first armour plate in 1888 and their first artillery piece in 1890. Vickers bought out the Barrow-in-Furness shipbuilder The Barrow Shipbuilding Company in 1897, acquiring its subsidiary the Maxim Nordenfelt Guns and Ammunition Company. at the same time, to become Vickers, Sons & Maxim. Ordnance and ammunition made during this period, including World War I, was stamped V.S.M. The yard at Barrow became the "Naval Construction Yard". 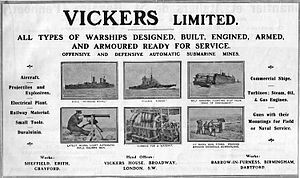 With these acquisitions, Vickers could now produce a complete selection of products, from ships and marine fittings to armour plate and a whole suite of ordnance. In 1901 the Royal Navy's first submarine, Holland 1, was launched at the Naval Construction Yard. In 1902 Vickers took a half share in the famous Clyde shipyard John Brown and Company. 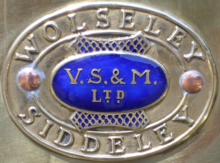 Further diversification occurred in 1901 with the acquisition of a proposed business which was incorporated as The Wolseley Tool and Motor Car Company and in 1905 the goodwill and patent rights of the Siddeley car. In 1911 a controlling interest was acquired in Whitehead and Company, the torpedo manufacturers. In 1911 the company name was changed to Vickers Ltd and expanded its operations into aircraft manufacture by the formation of Vickers Ltd (Aviation Department) and a Vickers School of Flying was opened at Brooklands, Surrey on 20 January 1912. In 1919, the British Westinghouse electrical company was taken over as the Metropolitan Vickers Electrical Company; Metrovick. At the same time they came into Metropolitan's railway interests. A reorganisation during 1926 led to the retention of the rolling stock group: Metropolitan Carriage wagon and Finance Company and The Metropolitan -Vickers Company and the disposal of: Vickers-Petters Limited, British Lighting and Ignition Company, the Plywood department at Crayford Creek, Canadian Vickers, William Beardmore and Co, and Wolseley Motors. In 1927, Vickers merged with the Tyneside based engineering company Armstrong Whitworth, founded by W. G. Armstrong, to become Vickers-Armstrongs, Ltd. Armstrong Whitworth had developed along similar lines to Vickers, expanding into various military sectors and was notable for their artillery manufacture at Elswick and shipbuilding at a yard at High Walker on the River Tyne. Armstrongs shipbuilding interests became the "Naval Yard", those of Vickers on the west coast the "Naval Construction Yard". Armstrong Whitworth Aircraft was not absorbed by the new company. In 1928 the Aviation Department became Vickers (Aviation) Ltd and soon after acquired Supermarine, which became the "Supermarine Aviation Works (Vickers) Ltd". In 1938, both companies were re-organised as Vickers-Armstrongs (Aircraft) Ltd, although the former Supermarine and Vickers works continued to brand their products under their former names. 1929 saw the merger of the acquired railway business with those of Cammell Laird to form Metropolitan Cammell Carriage and Wagon (MCCW); Metro Cammell. In 1960 the aircraft interests were merged with those of the Bristol, English Electric Company and Hunting Aircraft to form the British Aircraft Corporation. This was owned by Vickers, English Electric and Bristol (holding 40%, 40% and 20% respectively). BAC in turn owned 70% of Hunting. The Supermarine operation was closed in 1963 and the Vickers name for aircraft was dropped in 1965. Under the terms of the Aircraft and Shipbuilding Industries Act BAC was officially nationalised in 1977 to become part of the British Aerospace group, which exists today in the guise of BAE Systems. The Aircraft and Shipbuilding Industries Act also led to the nationalisation of Vickers' shipbuilding division as part of British Shipbuilders. These had been renamed Vickers Armstrong Shipbuilders in 1955, changing again to Vickers Limited Shipbuilding Group in 1968. This division was privatised as Vickers Shipbuilding and Engineering Ltd (VSEL) in 1986, later part of GEC's Marconi Marine. It remains in operation to this day as BAE Systems Submarine Solutions. With their steelworking operations also nationalised into British Steel Corporation the remnants of Vickers became Vickers plc. In 1986, Vickers acquired the armaments manufacturer Royal Ordnance Factory, Leeds, which became Vickers Defence Systems. Other acquisitions included automotive engineers Cosworth in 1990, waterjet manufacturer Kamewa in 1986 and Norwegian marine propulsion and engineering company Ulstein in 1998. 1998 also saw the sale of Rolls-Royce Motors and Cosworth to Volkswagen Group for £430 million, beating out BMW's offer of £340 million. Vickers remained independent until 1999 when the then Vickers plc was acquired by Rolls-Royce plc who sold the defence arm to Alvis plc, which became Alvis Vickers. 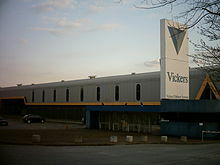 Vickers plc and the subsidiaries retained by Rolls-Royce were renamed Vinters in March 2003. The Vickers name lived on in Alvis Vickers, until the latter was acquired by BAE Systems in 2004 to form BAE Systems Land Systems. BAE Systems announced on 31 May 2012 that the ex Vickers Defence Systems factory on Scotswood Road, Newcastle would close at the end of 2013. The callsign Vickers is still used by the corporate flight department of BAE Systems Maritime Submarines, based at Walney Airfield, Cumbria. Vickers: Against the Odds 1956–1977 by Harold Evans. ^ Trebilcock, Clive. The Vickers Brothers: Armaments and Enterprise 1854–1914. London: Europa Publications, 1977 pp. 27, 33, 35, 43, 45–8, 127–9. ^ "Submarine Heritage Centre". Archived from the original on 4 July 2007. Retrieved 22 February 2013. Wikimedia Commons has media related to Vickers. This page was last edited on 26 January 2019, at 22:49 (UTC).